More than just CBD, these products have hundreds of Cannabinoids and other beneficial components of the whole Hemp plant. This powerful plant medicine is so healing for so many different reasons. Our Endocannabinoid Systems are severely lacking the nutrition from cannabinoids in our diet. Hemp is packed full of these nutrients without the THC, the element in Marijuana that produces the psychoactive effect or "high." To learn more or browse our products, please click on the image to the right! Bare Essentials are the products we make to use in our treatments, & are also customized for your self-care needs. Handcrafted, organic products are thoughtfully created according to your personal needs & preferences. You can order these specialized products at your next appointment or by contacting us here. Prices vary depending on the superior quality ingredients & amount of professional, clinical grade Essential Oils used. We only use organic, sustainable resources for our Medicinal products. Over 600 tests are performed to ensure that Nature's Sunshine products are of the highest quality, & their impressive selection is consistently on the rise. This company was the very first to encapsulate herbs & has over 40 years of experience in the Natural Health industry. Their unique products & formulas service all systems of the body & are an unparalleled compliment to Bare Medicine's services. We are passionate about Clinical Aromatherapy here at Bare Medicine & are proud to offer you Medicinal, Therapeutic Grade Essential Oils for your personal use & home care. We only use professional quality Aromatic Medicine in our products & services & will only supply you with the best quality Aromatherapy products for your own use. Every Essential Oil brand we use and endorse are all accepted by the National Association of Holistic Aromatherapy. 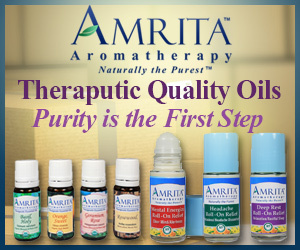 Please click on the photo to be redirected to the Amrita website.